Why is my cat toileting in the wrong place? Cats feel particularly vulnerable when they toilet, so they may shun their litter tray if it doesn't feel safe - or clean. Never punish your cat for inappropriate toileting, as this may make the problem worse. Talk to your vet before trying behavioural interventions as there may be a medical cause for your cat's behaviour. There are many reasons why your cat may toilet in the 'wrong' place. 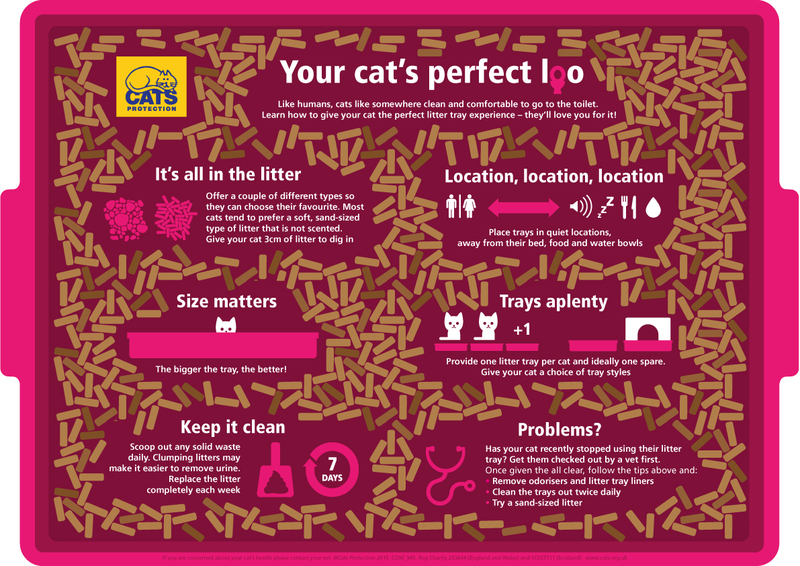 We'll explore the reasons here, and offer suggestions for encouraging your cat to use their litter tray. Always get your cat checked by your vet before trying to change their behaviour. A qualified behaviourist may be required if your vet, and the advice here, cannot resolve the issue. Even if your cat has outside access, always provide litter trays inside. Some cats feel safer using a tray inside the house, particularly as neighbourhood cats may intimidate them. Your cat may be reluctant to toilet outside in bad weather or if the toileting site is frozen and they can't dig. Because cats are vulnerable during toileting they try to find somewhere quiet and private. If your cat is upset by an incident outside, or near their litter tray, they may look for a quiet corner inside to pass their waste. Open spaces can make your cat feel vulnerable, so place their litter tray somewhere quiet, away from noises like washing machines and disturbances like doorways, corridors and cat flaps. Every cat is different, so there is no particular tray that will suit all cats. Cats generally need full-sized litter trays that are large enough for them to turn around in. Elderly cats need trays with low sides so they can easily get in and out. Nervous cats may appreciate hooded trays. Provide one litter tray per cat, plus an extra one. If your cats are not using their litter trays, you may need to provide additional trays or move their location. Place litter trays in a variety of locations, both upstairs and downstairs, rather than placing them in a row. Cats often prefer the litter they used as a kitten. Many cats like fine, heavy, sand-like litter, which is similar to the material their ancestors used. This feels soft under their paws and allows them to dig easily. Avoid scented litters as cats have a very sensitive sense of smell. Provide 3cm of litter as this is generally preferred; it's deep enough to dig, but not too deep. Cats are famously clean creatures and they will not use dirty litter trays. Remove any deposits once or twice a day if you have a clumping litter and completely clean the tray once a week. Some cats prefer the deposits to be removed before they will use the tray again, while other cats prefer one tray for urinating and one tray for defecating. Hooded trays must be kept very clean as they can trap odours inside and overpower your cat's keen sense of smell. 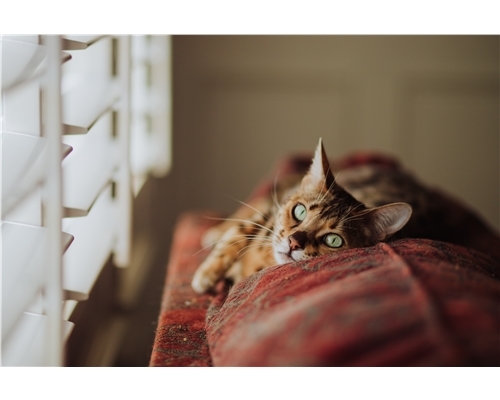 If your cat has urinated in your home, cleaning the area thoroughly will help to remove the strong odour - and may help to deter them from urinating in the same place again. You can make a cheap and effective cleaner with a warm, 10% solution of biological washing powder. Wash the area thoroughly, rinse with clean water and then allow the area to dry. If the surface is suitable, you can use surgical spirit after cleaning to remove all lingering traces of urine. Do a small patch test first to check that this cleaning method will not cause any damage. Carpet is extremely absorbent and urine often soaks into the underlay and the floor underneath. If the area is badly soiled over a long period it may be necessary to cut out the section of carpet and clean the concrete or floor boards underneath before replacing.